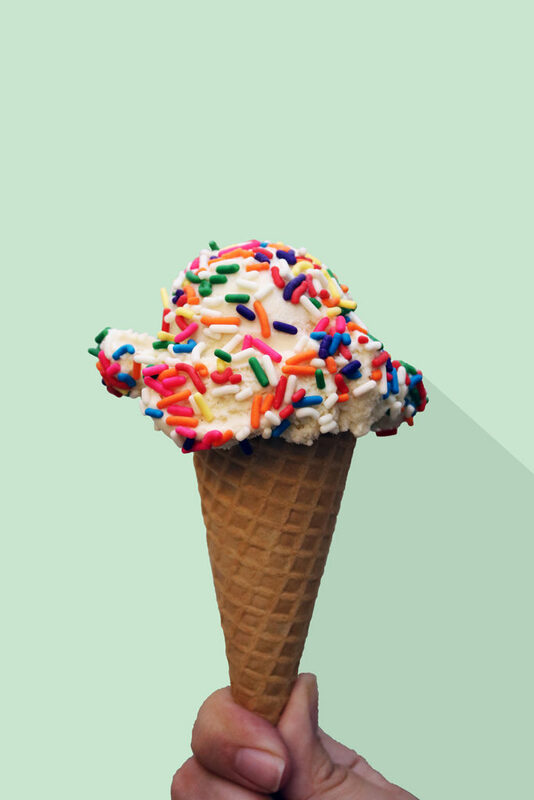 A scoop of Vanilla Bean ice cream, made with Madagascar Bourbon vanilla beans, with rainbow sprinkles on a sugar cone from Mitchell’s Homemade Ice Cream. When walking into an ice cream shop, and especially when trying to beat the summer heat, the last thing a customer may expect is to feel warm – yet that’s what happens at Mitchell’s Homemade Ice Cream. By opening the doors of one of the nine shops throughout the Northeast Ohio area, guests are greeted with the smell of freshly baked ice cream cones and a smile from across the glass case holding close to 20 ice cream flavors made from scratch. 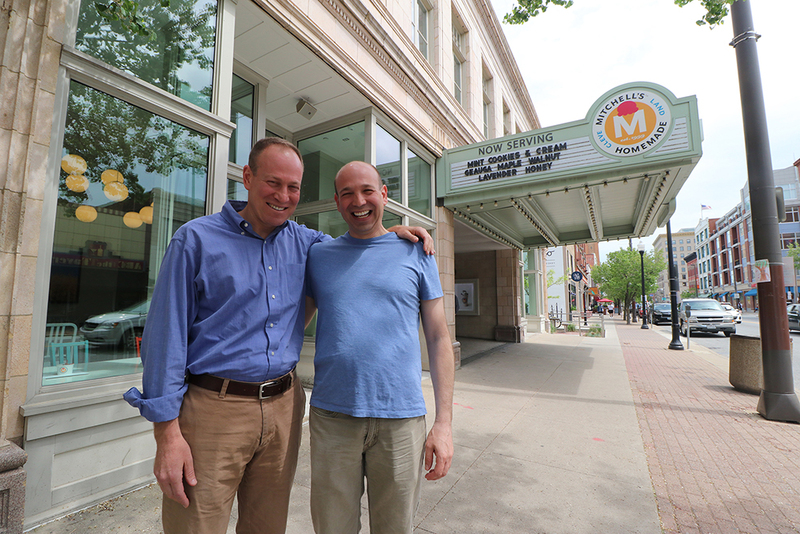 Pete and Mike Mitchell stand outside Mitchell’s Homemade Ice Cream’s flagship store in Cleveland’s Ohio City neighborhood, which the brothers opened in 2014. That transaction, as one might expect, is easier when the currency is ice cream. Still, the Mitchell brothers, both members of Temple Israel Ner Tamid in Mayfield Heights, don’t rely solely on sweetness to brighten customers’ days. On the contrary, there are many ingredients to their recipe for success, beginning with those used to create their tasty treats. 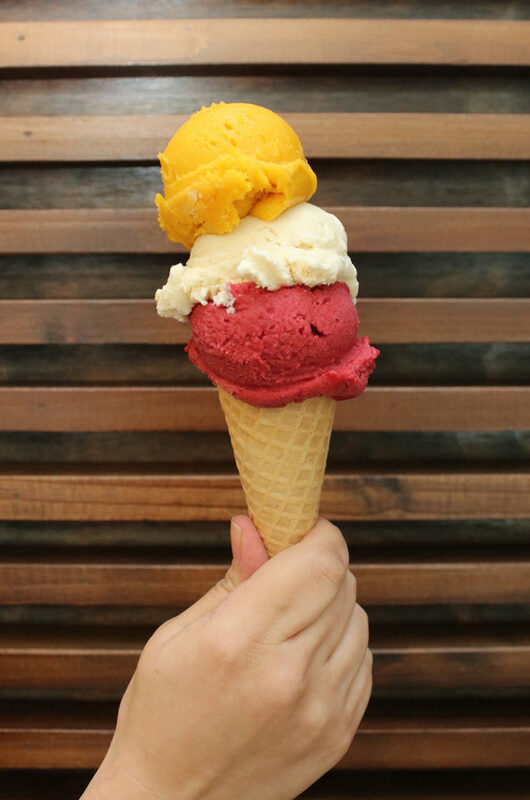 A triple scoop sugar cone with Mango Sorbet, Vanilla Bean and Raspberry Sorbet. From where the brothers purchase ingredients is the responsibility of Mike, who says his decision begins with the best flavor but doesn’t end there. Depending on what ingredients Mike is looking for changes where the farmer is going to be. For ingredients like strawberries or lavender, he has a list of go-to local farmers with whom he’s built relationships since the first Mitchell’s store opened in 1999 in Westlake. Those close working relationships are what make it possible for strawberries to go from farm to cone within 36 hours of being harvested. They also help the brothers build community in Northeast Ohio, which is the market they say they don’t want to expand beyond. “We’re Northeast Ohio, (and) all we ever want to be is Northeast Ohio,” says Mike, 41, of Cleveland Heights. “These farmers we like to work with, they are close to us – and we like to have a very good handle on (what’s produced). It’s always fresh, (and) there’s a small carbon foot print, so that’s great. If an ingredient isn’t native to Ohio, Mike looks both nationally and internationally to find partners that meet the company’s standards. Suppliers from outside the country can prove troublesome as there are instances of indentured servitude around the world. Once the ingredients are secured and put together at Mitchell’s Homemade Ice Cream’s flagship store in Cleveland’s Ohio City neighborhood, it’s ready to serve. On the menu this summer are flavors like Campfire S’mores, Fresh Peach, Lavender Honey, Coconut and Strawberry Rhubarb Crisp – all kosher certified (along with the other flavors) by Quality Kosher Supervision in Canton. No matter the ice cream, the taste has to be just right, which is why finding organic ingredients is so important to Mike’s recipes. Once he finds a supply of an ingredient, like a perfectly ripe fruit, he says the flavor is incomparable to any artificial flavoring. Mike bases whether a flavor is going to work on Pete’s palate. The journey to a new flavor can be short and sweet, but more unique flavors inspired by chance can take a few years to come to fruition. One flavor idea was inspired by a dessert Pete’s son, Ben, had at a Yours Truly Restaurant. Ben wanted the flavor to be an ice cream, and after asking Mike to create the recipe for close to six years, it eventually was added to the Mitchell’s menu as Wildberry Crumble. With the recently renovated Beachwood and Solon locations, a newly opened Strongsville store and a store scheduled to open in 2018 in Shaker Heights’ Van Aken District, Mitchell’s Homemade Ice Cream has a larger presence than ever. 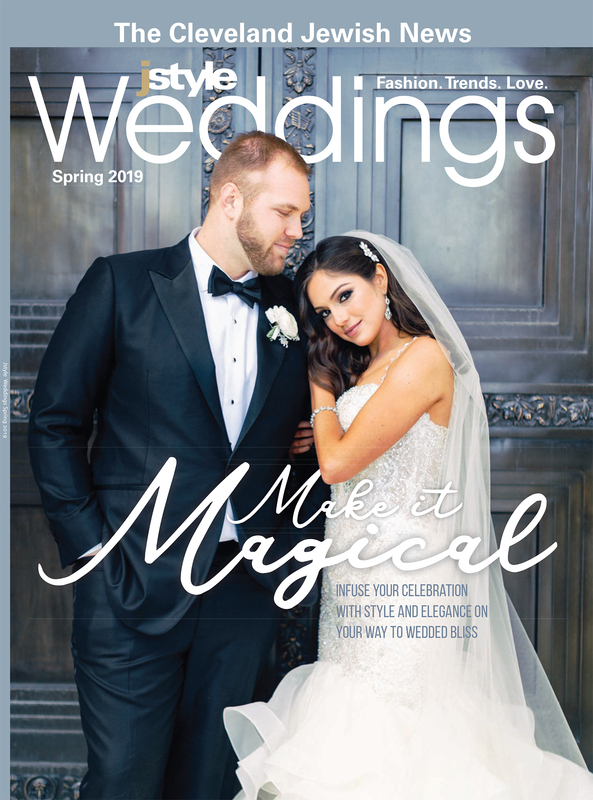 Even so, there’s a sense of connectedness between all the shops the brothers hope will strengthen their bonds – and customers’ bonds – to Northeast Ohio. 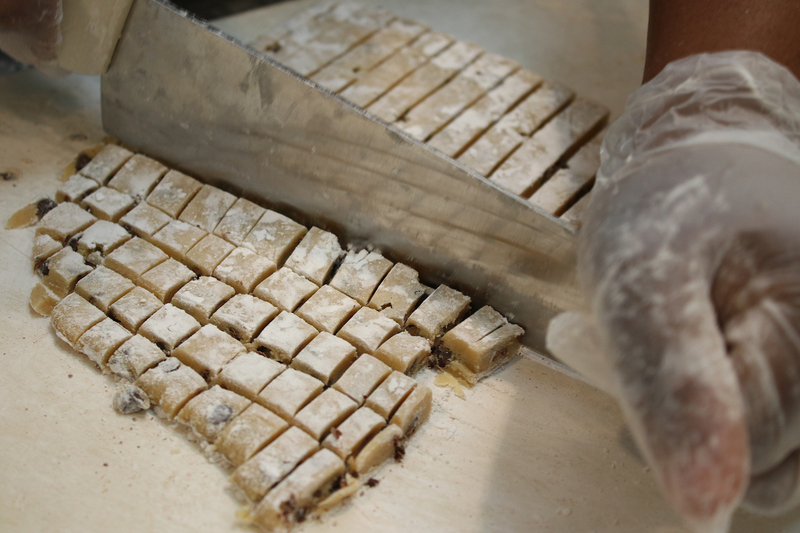 At Mitchell’s Homemade Ice Cream in Ohio City, chocolate chip cookie dough is chopped up for inclusion in the Cookie Dough flavor. For starters, many of the stores have large windows or doors so as not to keep out what’s happening in the surrounding community. At the Ohio City store, they take this concept one step further by surrounding the production facility with glass walls and inviting customers to watch how their ice cream is made. Also, artistic photos of the fields from which their ingredients are harvested adorn the walls of some locations, connecting customers to farmers. Even the furniture in Mitchell’s stores is designed and made by local artisans. It’s because of this strong connection that the brothers don’t want to expand past Northeast Ohio or even distribute pints outside the area. By staying local, the brothers feel they can have a greater, more meaningful impact and true to tikkun olam values they were raised with as children in University Heights.